Written by Surge volunteer Phil McCarter. 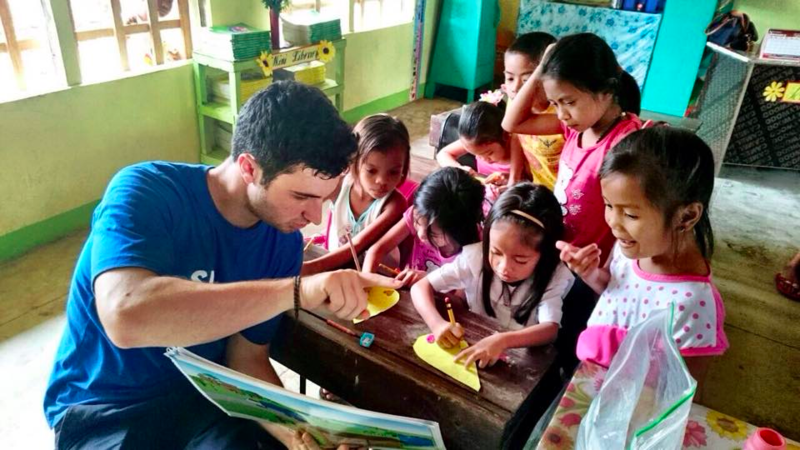 Read his first two updates from the Philippines here and here. 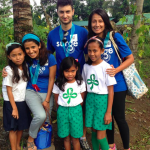 Our final, and longest stop in the Philippines was in Tacloban; a small city in the central province of Visayas. As you may know, this was one of the cities that were battered by Super Typhoon Haiyan (or Yolanda, as it is referred to locally) back in late 2013, suffering immense, widespread damage and loss of life. I am sad to report that unfortunately the place was not in good shape when we arrived a little less than 15 months later. We landed at a small airport, comprised of a short runway and a small building containing just one baggage belt and a couple of counters. During our taxi ride from the airport, we could see the immense destruction from the Super Typhoon still apparent. About seven in ten buildings looked dilapidated or damaged and although it had more of an urban feel about it, the place looked no more affluent or developed than the poor villages we had just visited in Mindanao. It was clearly still reeling heavily from the destruction caused by Haiyan. Despite all of the international aid efforts since the event, it still felt like this was the place we would be needed most. We finally arrived at Z-Pad, the place we would call home for the next 5 nights. The next day, we set off to meet our final prospective Philippine partner, Volunteers for the Visayans (VFV); a non-profit NGO that designs and implements social welfare and development projects that serve underprivileged local communities. We visited their office, which was located in the heart of a rundown, yet typical residential area, to meet their employees and learn about what they do. They cover a wide range of development areas, from distributing school supplies to some of the area’s most remote and underfunded schools (a few of which we would be visiting!) and sponsoring the construction of new school buildings, to community feeding programs and tutoring services. Over the course of the next few days, Princess, a kind VFV representative, escorted us far and wide to various schools in the surrounding rural communities. 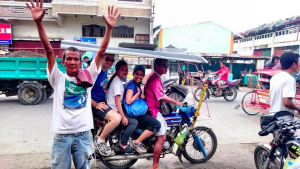 These schools were so difficult to access that traveling to one of them usually entailed a combination of several of the most common Philippine modes of transport. Jeepneys (a very elongated jeep with an open back able to fit about 25-30 people) would take us the bulk of the way on the main roads, and then tricycles (a motorbike with a large passenger kart attached) or pedicabs (a bicycle with a small passenger kart attached) would take us a little further, down the smaller rural roads. Finally, when the village roads were in too poor of a condition, regular motorbikes and my personal favourite, the hubble-hubble (an extra long, extended motorbike that can fit up to 5 people) would take us the final leg and drop us at the door of the school! A lot of trust was invested into the hubble-hubble drivers as we hurtled down bumpy, muddy, narrow roads, dodging potholes and the occasional person as we went by. The schools in these villages were the worst I had ever seen. Some of them barely had a functioning latrine and others drew their water from open wells that looked to almost surely be contaminated. VFV had initiated some programs with these schools, either in the form of providing school supplies or Sawyer water filters for the students and staff to use to purify their drinking water. From Surge’s perspective, our aim was to partner with VFV to implement water and sanitation projects that it was clear these villages so desperately needed. 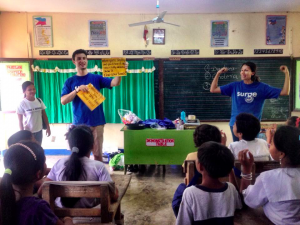 And whilst there, scoping out the villages’ current sanitation situations, we of course delivered our special WASH training at each village’s elementary school. The children in these schools were extremely happy to see us and displayed the same level of passion as all the others had before them. Each time, it was incredible to see the faces of the kids light up as we introduced and played each of the fun, interactive games in the program. Just the virtue of us being there seemed to have a huge impact, simply because they recognise that we care. Interestingly, they speak a different dialect in Visayas than they do in Davao, and little did we know that many of the WASH-specific words we had put a lot of effort into learning in Tagalog were no longer applicable! The students and teachers were too kind to point this out, of course, so we ended up making a bit of a fool of ourselves since Princess, our designated translator, was accompanying Shilpa in her classes with the younger children! At the end of each session throughout the trip, we distributed a paper water drop (which we spent a good few of our nights cutting out!) to each child for them to write or draw something that they learned from the class. At the end, the teacher would then collect all of the drops from the students and promise to create some sort of collective display of the drops on the classroom wall in the following days (some of the teachers actually sent us pictures of these after they had been created, which was a pleasant surprise!). There were clearly some very talented students in these classes and it is extremely saddening to think that many of them will not be able to pursue an education beyond an elementary level, and almost certainly not beyond high school. In one of the villages, we were scoping out the village well and collecting water to be used in the hand washing demonstration section of the WASH training, when a schoolboy no older than 9 or 10 came by with a large hand-held container. To all of our surprise, he filled it right up to capacity and prepared to walk back down the street in the same direction as us. The container looked to be about 15 litres, and when full probably weighed about half of what he did. 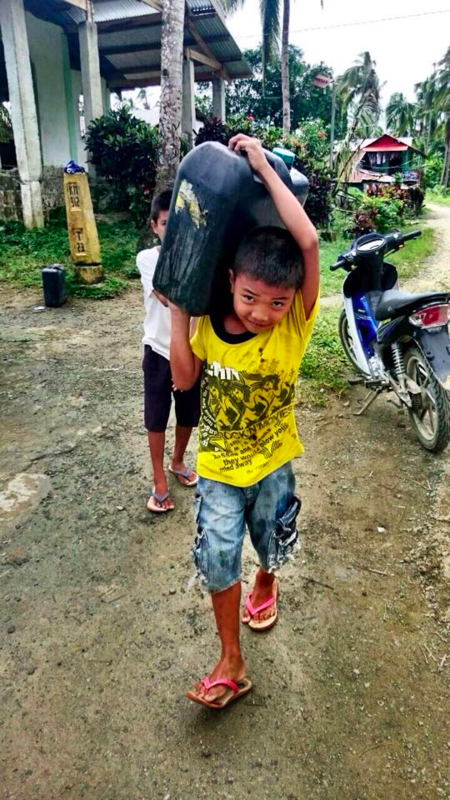 I asked if I could help him carry it; I wanted to know how heavy it felt to have to carry that quantity of water the fair distance he was about to carry it, since this is probably what he has to do on a daily basis. I picked it up after the boy seemed to reluctantly agree to let me carry it (he is probably so used to it that he may have been wondering why on earth I was insisting on carrying it for him, or perhaps he thought I was going to steal it!). After not much more than a minute or so, I already started to feel the effects of the weight, particularly in my shoulders. I can only imagine how the young boy, significantly smaller than I, copes with such a task. Nevertheless, after a couple of minutes he insisted on taking over!. 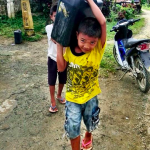 This sort of thing, while pervasive in developing countries, is upsetting to see, as it shows just how much of a part of life water fetching has become for the child. No child should have to miss school to spend time collecting something that is a basic human right.